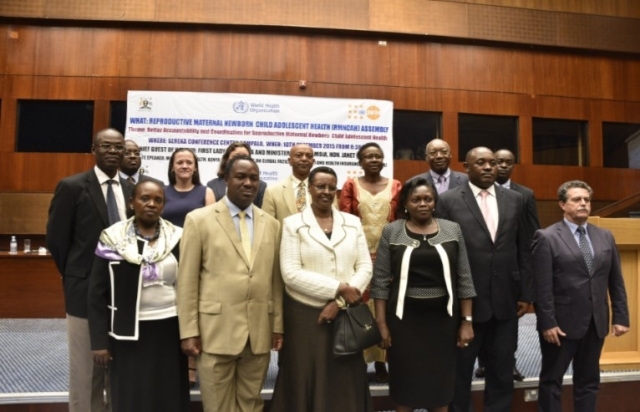 Kampala 16th December 2015: The Reproductive Maternal, Newborn, Child and Adolescent Health (RMNCAH) assembly took place at Serena Hotel in Kampala under the theme “Better accountability and coordination for Reproductive Maternal, Newborn, Child and Adolescent Health. The meeting was organized for stakeholders to share experiences and lessons learned around the development, use and sustainability of an engagement platform for the RMNCAH stakeholders for better health outcomes of mothers, children and adolescents and improved accountability mechanisms. The First Lady of Uganda, Hon Janet Kataha Museveni, the RMNCAH champion, in her remarks to open the assembly thanked the Ministry of health for the services rendered to mothers and children of Uganda, and further in special way thanked the World Health Organization (WHO) for the continued technical support it gives to the government and other partners for working with the Ministry of Health (MoH) in improving the lives of mothers and children. She said that a lot of work has been done and a lot of impact made in health, but pointed out that maternal health is persistently performing poorly. Hon. Janet decried the increasing numbers of abortion especially among teenage mothers, saying they are a major contributor to maternal mortality. She further said that there is need to address teenage pregnancy, and called upon parents to work together with leaders to sensitize adolescents. Hon. Dr. Elioda Tumwesigye the Minister of Health in his remarks reiterated the First Lady’s remarks on the issue of maternal mortality. He said that it remains a problem that needs to be tackled. He also expressed his gratitude for the extension of A Promise renewed; an umbrella that brings together governments, civil society, the private sector and individual citizens to stop women and children from dying of causes that are easily avoidable. 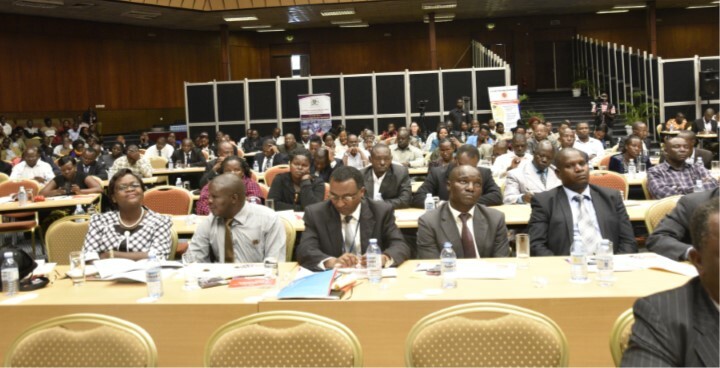 Dr. Elioda further called for need to adopt effective communication mechanisms between government and partner. He also pointed out the need to increase the number of midwives at the health centers to address complication while delivering their babies. He concluded his remarks by calling for the need to ensure that every constituency has emergency obstetric care services. 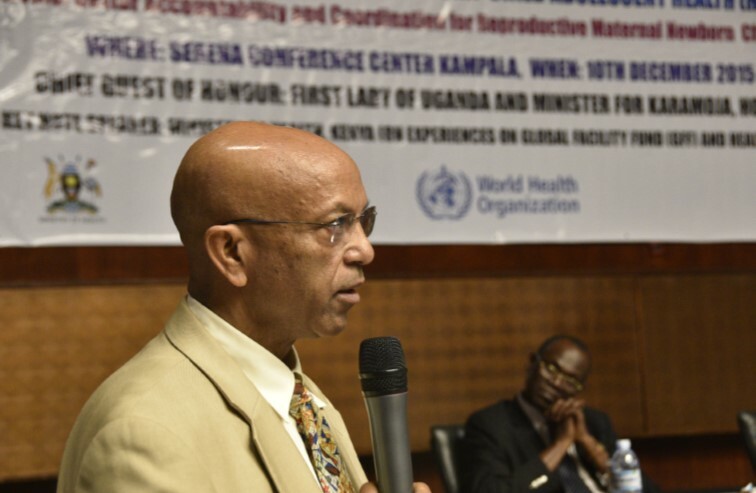 Dr. Alemu Wondimagegnehu, the WHO Country Representative spoke on behalf of the United Nations (UN) Family. He said that about 6000 women die annually due to pregnancy related causes in Uganda. He further said that although Family Planning use is known to contribute significantly to the reduction of maternal mortality almost by 30%, the contraceptive prevalence rate is still low, at only 30% with an unmet need of 34%. He called for a concerted effort to reduce the unmet need and step up use of family planning methods. Dr Alemu further highlighted the need to work towards integrated coordination platforms which bring together the various players in order to implement the RMNCAH interventions within a strong health system building, on the already existing mechanisms which he said requires strong government leadership. At the assembly Dr. Peter Okwero from the World Bank also made a presentation on the Global Financing Facility, calling for the need to adopt financing, where countries know their needs, how to achieve those needs and how to apply existing evidences in order to achieve them. The assembly attracted a huge turn-up of stakeholders that include government departments and District health teams from 112 districts together with many of the implementing partners of the USAID and UN funded projects within RMNCAH, the UN Family, Civil Society Organizations, scholars as well as the media.